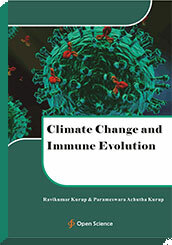 Climate change leads to immune evolution and an epidemic of autoimmune diseases. Global warming can lead to osmotic stress consequent to dehydration. The increase in actinidic archaeal growth leads to cholesterol catabolism and digoxin synthesis. Digoxin produces membrane sodium potassium ATPase inhibition and increase in intracellular calcium producing mitochondrial dysfunction. This results in oxidative stress. The oxidative stress and osmotic stress can induce the enzyme aldose reductase which converts glucose to fructose. Fructose has got a low km value for ketokinase as compared to glucose. Therefore fructose gets phosphorylated more to fructose phosphate and the cell is depleted of ATP. The cell depletion of ATP leads to oxidative stress and chronic inflammation consequent to induction of NFKB. Fructose can fructosylate proteins making them antigenic and producing an autoimmune response. This can lead to global warming related autoimmune disease. Climate change related immune evolution can have catastrophic consequences.